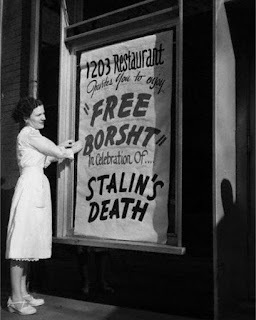 Few may yet remember that when the Communist murderer Stalin died in 1953, people celebrated his death and 'free borscht' was provided to celebrants. - Well, in the exile communities abroad. The Ukrainians and millions of other dead, plus the residents of the USSR didn't get any beet soup. 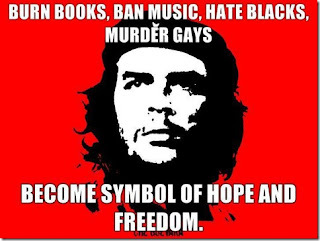 Stalin murdered far more people than that other Communist murderer 'Che' Guevara, and he didn't get any beet soup. Neither did 'Che' who got a bullet fiesta instead. - Not even a t-shirt. I'd say that was just about all the "social justice" these two murderous Commie assholes deserved.